Image caption Robbie said she hoped the film would have a "positive impact on children"
In a statement, Robbie said playing with the doll promoted "confidence, curiosity and communication". "I'm so honoured to take on this role that I believe will have a tremendously positive impact on children," the Australian actress continued. 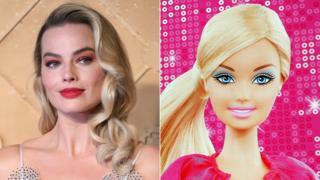 Robbie, 28, said she could not have imagine "better partners" than Warner Bros and Barbie creator Mattel. "Margot is the ideal producer and actress to bring Barbie to life on screen in a fresh and relevant way for today's audiences." said Toby Emmerich of Warner Bros.
"I'm bummed, but look forward to seeing Barbie on the big screen," the star of Trainwreck said at the time. In October, it was reported that the film, previously a Sony production, would use a "revised" script by Ocean's 8 writer Olivia Milch. Scandinavian band Aqua famously had a hit in 1997 with their single Barbie Girl, which contained the lyrics: "Life in plastic, it's fantastic."